As in many European countries, access to finance in Greece is rather limited for micro and small enterprises, the self-employed, social cooperatives, and social enterprises. In access to finance, the European Commission´s SME Performance Review gives Greece the lowest score of all EU-28 countries by a wide margin, and states that since 2008 conditions have substantially worsened, at a faster rate than the EU average. Greek micro and small enterprises employ twice as much people compared to the EU average and therefore play an important role in the Greek economy. However, the European Commission estimates that more than half of all microenterprises are in danger of closing because of the precarious state of the economy. 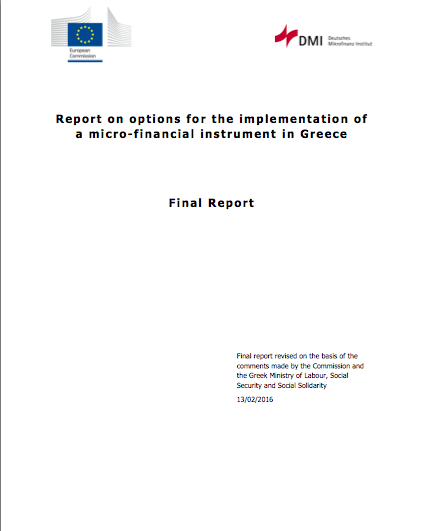 In order to identify and assess options for the implementation of a suitable microfinance instrument in Greece, the European Commission contracted DMI to explore the key elements of a sustainable delivery model. The result of DMI´s work is that a microfinance system that is developed in a bottom-up process and based on a Partnership Model is the most appropriate model for Greece. It will facilitate access to finance not only for start-ups and microenterprises, but also for small and social enterprises. - The bank which disburses the loans. - A guarantee fund which bundles all risk-sharing arrangements. - A Quality Risk and Network Manager which assures the quality of the partners and of the whole system.